Denver International Airport had a banner year in 2018. It continued to log impressive passenger growth levels and launched a facilities revamp that includes a terminal overhaul and the addition of 39 gates in order to meet forecast passenger demand. The airport plays an important role for full service and low cost airlines alike. United, Southwest and Frontier are its three largest operators, and United has started rebanking Denver to bolster the airport’s already strong performance in its system. At the same time, Denver has also attracted new airlines during the past couple of years, including Norwegian and Copa. The airport also took top honours among the Wall Street Journal’s top US airport rankings based on a wide range of factors, including value and convenience, besting other large hubs and among them Los Angeles and Atlanta. Denver International Airport has booked solid passenger growth during the past few years as it has secured new routes from existing and new airlines. United’s rebanking in Denver should bolster profitability at one of the airport’s top performing hubs. Denver is embarking on an ambitious capital improvement programme but has gained recognition for its financing package for the upgrades. As construction begins, Denver is the top large US airport according to the Wall Street Journal’s inaugural airport rankings. 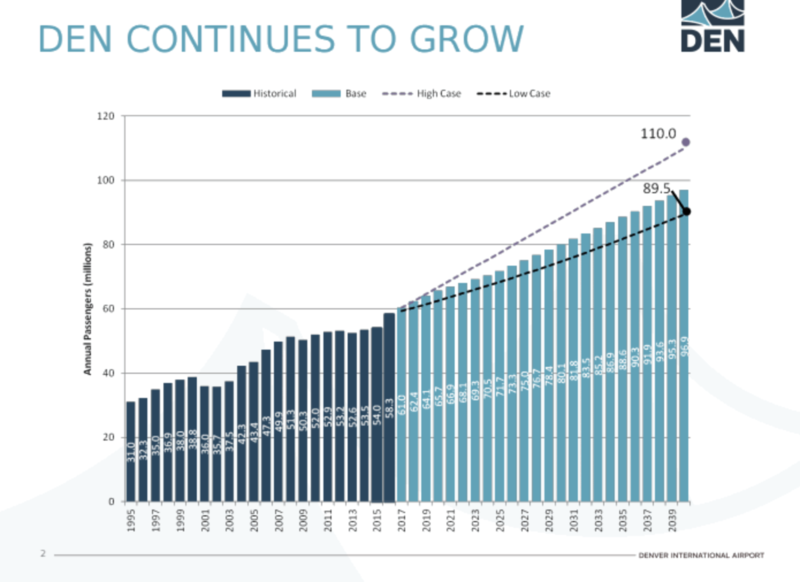 Between 2009 and 2017 Denver International’s passenger growth jumped 22%, to 61 million. The airport is consistently cited as one of the busiest in the US, and data from CAPA and OAG show Denver’s annual ASK growth was 10%, 7% and 9%, respectively, in 2016, 2017 and 2018. Over the past couple of years Denver has secured new services from Copa to Panama City – opening up numerous connections in Latin America – new flights from Norwegian to London Gatwick, and Edelweiss’ seasonal service to Zurich. United has also launched seasonal flights to London Heathrow and in May-2019 is launching year-round service to Frankfurt, a hub for its trans Atlantic JV partner Lufthansa. Lufthansa also operates from Denver to Frankfurt. The airport also welcomed new domestic markets in 2018, including Portland, Maine, Asheville, North Carolina, and Myrtle Beach, South Carolina. 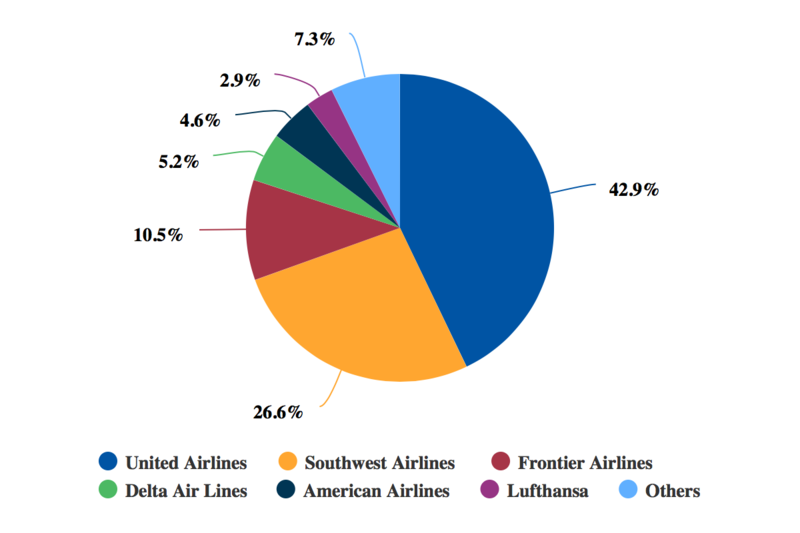 United is Denver’s largest airline by capacity share, holding a 42% market share for the 11M ending Nov-2018, followed by Southwest at 29.6% and Frontier with an 11.5% share. As of early Feb-2019, United operated close to 43% of Denver’s ASKs. Source: CAPA- Centre for Aviation and OAG. The airline has started rebanking Denver, which is United’s third largest system hub measured by weekly departing frequencies, numbering approximately 5,603 (according to data from CAPA and OAG). United has already completed rebanking its Houston Intercontinental and Chicago O’Hare hubs as part of a larger strategy of bolstering connectivity in order to improve its competitiveness in the domestic US. In addition to Frankfurt, United’s planned new domestic routes from Denver during 2019 include Charleston, South Carolina; Eureka, California; Flagstaff, Arizona, and Sonoma County, California. Even as United is working to rebank Denver, the airport has historically been a strong performer in the airline's network. In late 2016 executives from United remarked that Denver was its most profitable hub due to its higher percentage of connecting passengers, and the airport’s favourable job in keeping costs down. “There’s a high correlation between airline hub profitability and cost per enplanement”, United president Scott Kirby said at that time. 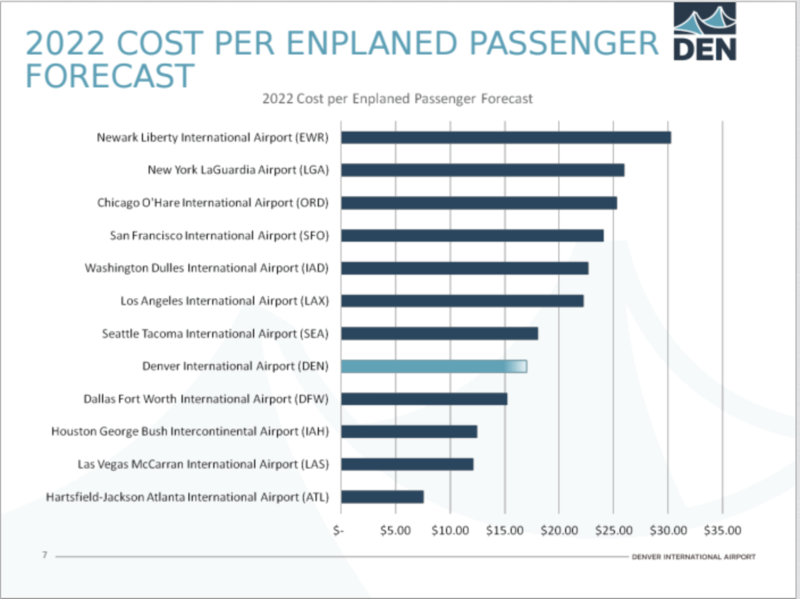 In 2017 the airport forecast that its cost per enplanement would be just above USD15 in 2022, which is solidly lower than the cost at United’s hubs in Newark, Chicago O’Hare and San Francisco. In late 2018 Denver International won the top spot in the Wall Street Journal’s inaugural ranking of the US’ top 20 airports. The business publication surveyed more than 4,800 of its readers responding on 15 measures. Denver ranked higher than other large hubs, including Dallas Fort-Worth, Los Angeles and Chicago. Denver also garnered that accolade just as it began a USD3.5 billion five-year capital improvement programme. The programme includes the addition of 39 gates (a 30% increase) spread across its three concourses and a terminal renovation that will have enhanced security, new dining options and more open and flexible check-in space. The gate expansion is necessary in order for Denver to accommodate projected passenger traffic. Projections show that the airport’s passenger levels could reach nearly 90 million by 2039. 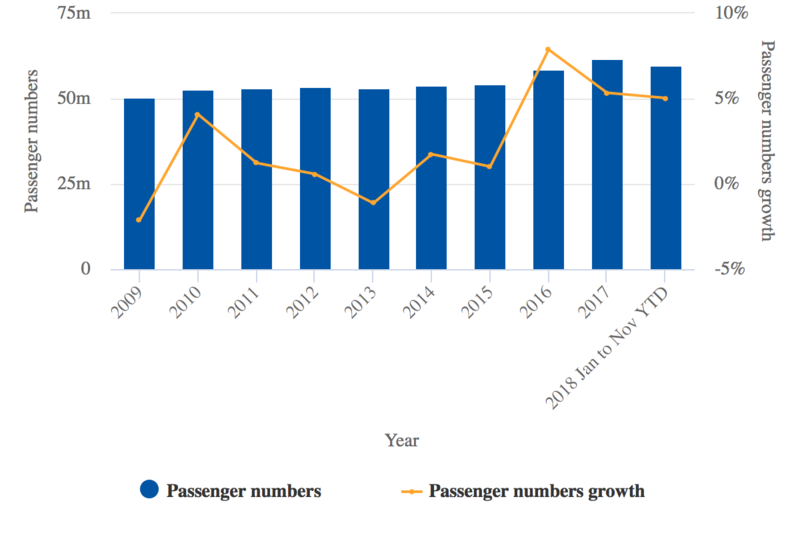 The airport was designed to handle 50 million passengers, yet its annual passenger throughput has consistently been above those levels since 2008. The airport issued USD2.5 billion in bonds to finance its capital improvement projects, which Bond Buyer concluded was the largest airport revenue bond in municipal bond history, and the publication recognised Denver International with its Deal of the Year Award. Bond Buyer remarked that the transaction “found a receptive market with 145 unique investors and USD5.7 billion in orders”. The total interest cost for the bond issue was 4.0%, with coupons ranging from 3.5% to 5.25% and the yield from 1.6% to 4.07%. Unlike some larger hubs in the US that are physically constrained, the airport has a footprint of approximately 53 square miles, which gives Denver International a level of flexibility for meeting future passenger growth projections that other airports do not enjoy. The airport’s challenge for the future is familiar – balancing meeting anticipated passenger capacity while working to ensure that its costs remain competitive for current and future airlines. Similarly to other US airports, Denver is no doubt working to make use of new and upgraded concessions to drive non-airline revenue in order to retain competitive costs. After successful growth during the past few years, Denver International airport is not resting on its laurels. It recognises the need for expansion and refurbishment in order to meet the needs of the future traveller and its airport operators to remain competitive in the short and long terms.